As we already know, small bits of exercise really do add up! But if you’re someone who would rather lift weights or do yoga than scrub the bathroom for a workout, then we have the answer for you: DVDs with 10-minute workouts! The latest trend in workout DVDs is titles filled with a bunch of mini workouts. Add them up for a longer workout or squeeze 10 minutes in here and there for a quick and workout-A.D.D.-proof exercise session! 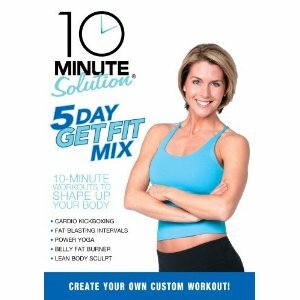 Find your perfect 10-minute workout DVD below! Amy Dixon: Give Me 10! The best part about these types of DVDs is the mix of activities they provide in just one DVD. And Amy Dixon’s Give Me 10! is no different. In this DVD, Amy gives you Fat Blasting Cardio, Upper-Body Sculpt, Lower-Body Firmer, Core Makeover, Yoga Stretch and Flex, and a Bonus KettleBell Tone Up. Something for everyone, for sure. And enough to push everyone to try something new, fo shizzle. I was a particular fan of the upper-body sculpt (holy burning shoulder exercises) and the cardio sessions. Also, the yoga works well as a longer cool down, as it’s more stretching than yoga really (so skip that one if you really want a workout in your 10 minutes). The production quality is a little low, but Amy Dixon is a seasoned instructor with excellent (and non-annoying) cues that more than makes up for it. She’s upbeat without being overly perky, and the sessions make you feel like you’re less in Hollywood and more in your local health club. The music isn’t great, but again, the workout more than makes up for it. Best for: FBGs who work out a few times a week and need a solid, no-frills DVD to put in their workout mix when they’re short on time! We like most of the 10-Minute Solution DVDs that we’ve reviewed. They’re always just solid, good workout DVDs. Nothing too fancy or special but always reliable for a good workout. And you can add this DVD to that sentiment, too. Instructor Amy Bento is likeable and totally down to earth. She also looks like she could bench me a few times, which a compliment, in my eyes. In the DVD, you also get a good mix of 10-minute workouts. The DVD is designed for you to do one a day for five days, but I mixed three together for a fun and exciting 30-minute workout. You can choose from Cardio Kickboxing (fun kicks and punches), Fat Blasting Intervals (cardio and strength for maximum calorie burn and time savings), Power Yoga (not a lot of strength-based moves here, but a decent yoga session), Belly Fat Burner (and it does burn) and Lean Body Sculpt (works the upper- and lower-body at the same time—woo woo). Although the exercises in this DVD are as moderately challenging as Amy Dixon’s DVD above, I feel like this title is more suited to beginners because this Amy is a little friendlier and more newbie-oriented and encouraging. The music is eh, but the 10 minutes just fly by! Best for: Beginners looking for a bit of challenge or intermediate exercisers wanting to shake up their workouts with a friendly and encouraging instructor. Full disclosure: I may not be able to be subjective on this DVD, as I write for SparkPeople and the instructor, Nicole Nichols, is my editor. With that said, I really, really liked this DVD. It is one of the best beginner workout DVDs we’ve reviewed. You get seven 10-minute strength and toning workouts (including a section with crunchless abs—which I loved), training tips and a bonus 15-minute cardio workout. If you’re a newbie, this DVD alone could get you started for at least a few months, especially if you could get outside and walk for extra cardio. The whole SparkPeople enterprise really gets how to motivate people in a realistic, doable way. Coach Nicole is super likeable and refreshingly normal. And she encourages small changes to get fit, instead of a huge overhaul of your lifestyle. Love that. The production quality on this DVD leaves much to be desired, but what’s in the DVD is so good that you really don’t notice. The moves are effective, and the instruction is dead-on. Best for: Beginners who are ready to make a lifestyle change. FIT BOTTOMED LINE: ALL OF THE ABOVE DVDS ARE SOLID. IF YOU’RE MORE ADVANCED, GO WITH AMY DIXON’S DVD. IF YOU’RE INTERMEDIATE OR A BEGINNER LOOKING FOR A CHALLENGE, INVEST IN THE 10-MINUTE SOLUTION DVD. AND, IF YOU’RE JUST STARTING OUT, SPARK IT UP!